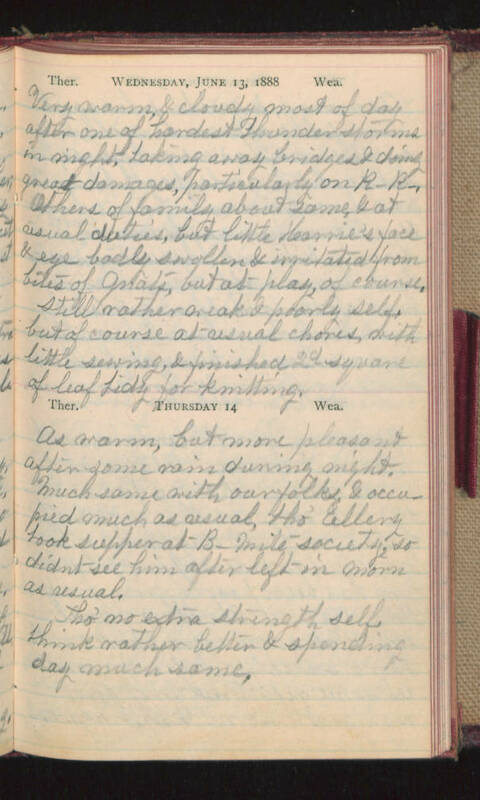 Wednesday, June 13, 1888 Very warm, & cloudy most of day after one of hardest thunder storms in night, taking away bridges & doing great damages, particularly on R-R-. Others of family about same, & at usual duties, but little Karrie's face & eye badly swollen & irritated from bites of gnats, but at play, of course. Still rather weak & poorly self, but of course at usual chores, with little sewing, & finished 2d square of leaf lidy for knitting. Thursday 14 As warm, but more pleasant after some rain during night. Much same with our folks & occupied much as usual, tho' Ellery took supper at B- Mite society, so didn't see him after left in morn as usual. Tho' no extra strength self think rather better & spending day much same.